I think the first thing I heard today was a deer. Whatever it was it seemed to be having nasal problems, snorting and sneezing a few times before bounding off down the trail. 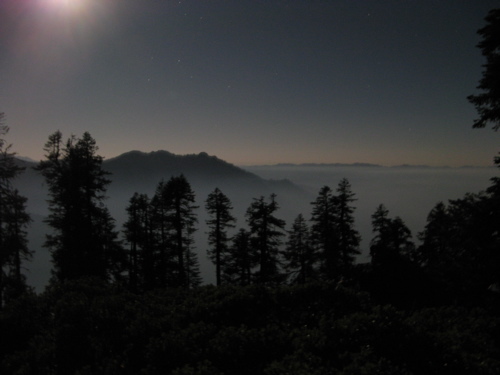 I got up for a little walk (bear in mind it is about 2:30am) and look out across the smoke filled valley below. The moon was halfway down and I could clearly see a ridge protruding above the white cloud like an island in the mist. I took a while getting the right camera settings, hopefully it looks good on a bigger screen. When I really got up a couple of hours later the moon was tinted orange from the ash in the air and just setting. The run to my camera yesterday seems to have triggered shin splints again so I set off slowly and managed to keep my speed under control. The eastern valleys were worryingly full of smoke and I was watching for planes or helicopters as a sign that I should turn and run, but none came and I think the fires are a long way away. I reached the road well ahead of time, left a note for BlueSky and Vortex, then hitched into Etna where I ate lots and was about to head to the California Campers Training Center when the adventure duo and Aaron showed up. CCTG trains volunteers to go do charity work in Africa, and if that wasn’t cool enough they also let PCTers stay, shower, do laundry and use the internet totally free! Someone deserves a big Christmas card. It feels so good to be clean again. It was my 9th day since Old Station and the sweat in my shirt and trousers was quite horrific. We all went to eat at The Trailhead but to get Vortex and Aaron back on the road in time I had to rush my burger and I felt very, very bad. So BlueSky and I are back on the trail. It sure will be different to hike with a partner again but she’s happy getting up early and we’ve both got people further north to stay with so it’s going to be good times ahead. The only downside of today was being so rushed that I didn’t replace the memory card in my GPS device and have missed 1 mile of the trail. I’m not prepared to re-hike it. This entry was posted on Sunday, July 29th, 2007 at 5:00 pm	and is filed under California, Cowboy, Hiking, Movie, Photo. You can follow any responses to this entry through the RSS 2.0 feed. Both comments and pings are currently closed. Heart-worm medication makes dogs afraid of people in hats? …Right. I have sorted out the missing mile. I teleported over to Sawyers Bar Road with a N40i and recorded the trail for a mile up the hill to the saddle.